In today’s post: Learn how to make your own raglan sleeve pattern in any size! Every year when it comes time to do our school shopping I’m amazed at how much it costs to outfit each child…and when you have 5, it really adds up! To make the cost a little less painful I do a lot of thrift store shopping and try to sew a few things using fabrics from my stash. 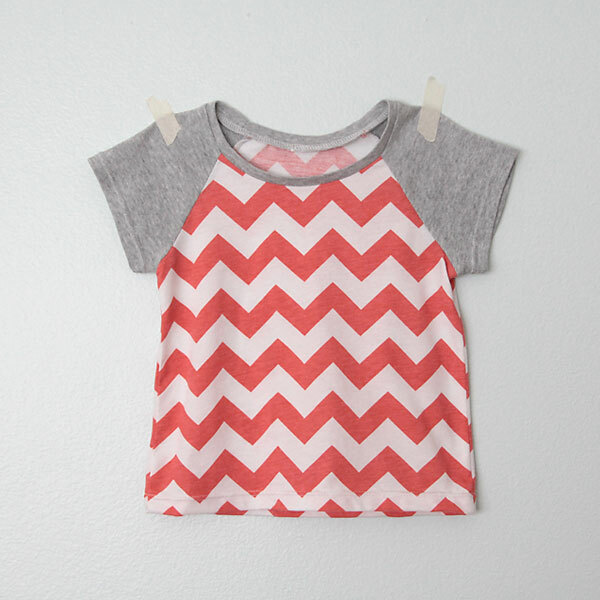 Raglan tees (baseball style tees) have been very popular for a few years now and they’re super easy to sew. In addition, when you mix and match colors and patterns they look a little cuter than a plain t-shirt. 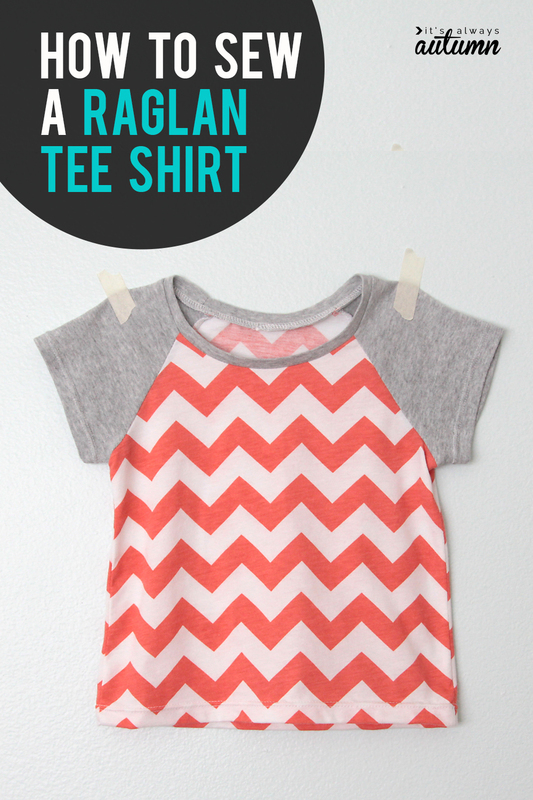 In today’s post I’ll show you how to draft your own raglan tee pattern in any size, and then I’ll show you how fast and easy it is to sew one up. Once your pattern is all set and you’ve made one shirt so you’re familiar with the process, you can whip out additional tops in about 45 minutes each. 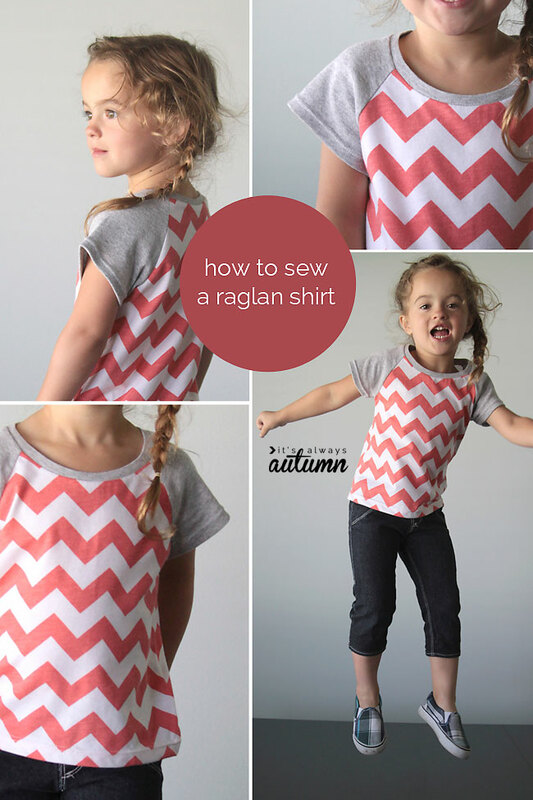 Raglans for younger kids are a great way to use up scraps of fabric left over from other projects. I like to use freezer paper to trace patterns – it’s cheap and comes in rolls that are wide enough for almost any child’s pattern piece. Place your t-shirt on the freezer paper, with the straight edge of the paper going through the exact middle of the shirt. Trace around the shirt as you can see in the photo above. For the sleeve, you want a straight line from the neckline down over the shoulder. I made the sleeve opening on my pattern a little larger than the one on my t-shirt because the t-shirt I was using had a gathered sleeve. Once you move the t-shirt, you’ll have a basic shirt outline, like the one you see below. 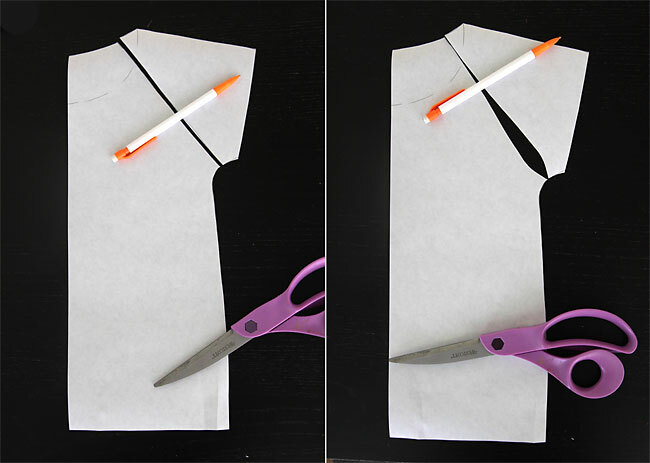 Draw a slightly lower neckline curve for the front of the shirt. Also draw a straight line from the armpit to the neckline, as you see below. 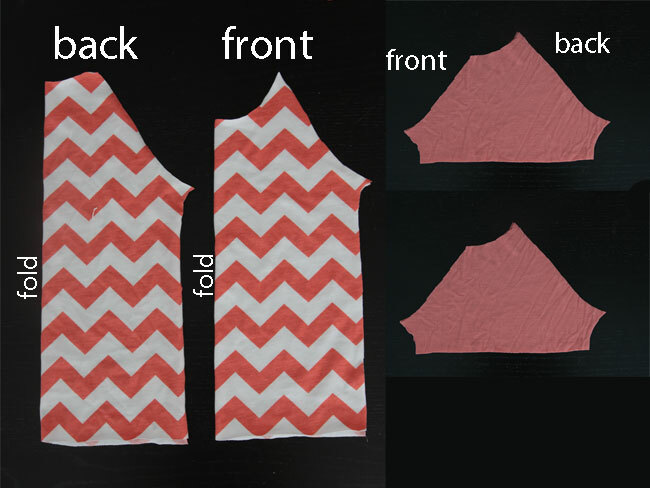 Cut the pattern piece out, and cut it apart at the armpit-neck line (1st photo below). The next step is optional, but I think it gives the shirt a little better fit. Cut a very slight curve into the line where you just cut the two pieces apart – you only need to take about 1/4 inch out of each pattern piece. It should look like the 2nd photo below. Now we’re going to retrace each of our two pattern pieces, this time adding whatever seam allowance and hem allowance you like to sew with. (You can see that I didn’t add seam allowance at the neckline, but I should have!) 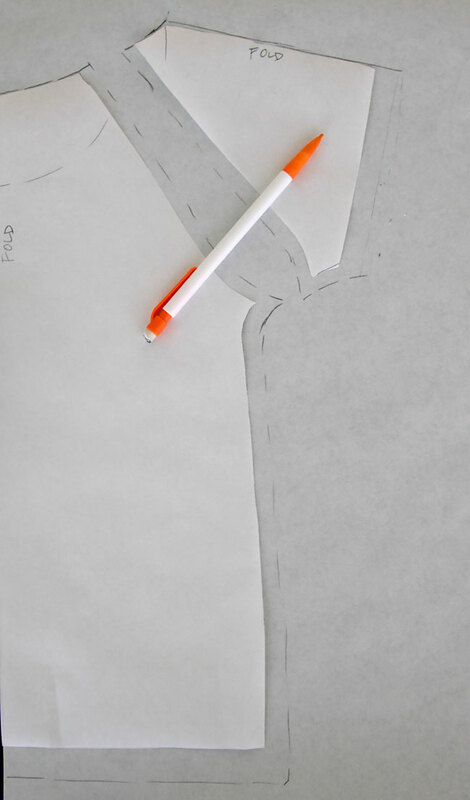 Remember to transfer the front neckline markings onto your new pattern pieces. Cut them out, and throw the old ones away so you don’t get mixed up! Just one more quick step to finish the pattern: right now the sleeve piece would have to be cut on the fold. 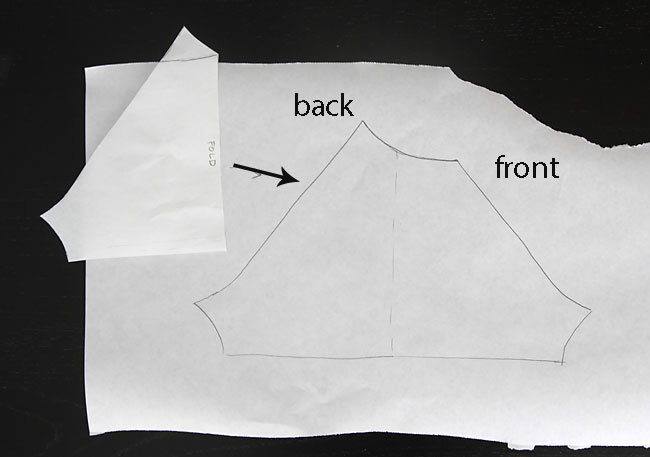 Trace around the sleeve pattern piece, then flip it over and trace around it again to get a full pattern piece. On one side of this pattern piece you’ll trace the back neckline (higher) and on the other side you’ll trace the front neckline (lower). Be sure to add a little room for a hem if you haven’t done so already. Alright, the hard part’s done! This shirt sews up extremely quickly. Start by unfolding the back bodice and laying it down on a table. Grab one of your sleeve pieces and lay in on top of the bodice, right sides together, as shown (make sure you’re using the taller side of the sleeve here). Stitch as shown. Next you want to match up the front bodice with the front (shorter) sides of each sleeve and sew them, again right sides together. Start at the bottom of the sleeves, sew up and under the arm, then back down the side. I like to give the fabric a gentle stretch as I’m sewing under the arm to make sure this seam won’t pop when the child lifts her arms. Then you just need to finish the neckline as desired and hem the shirt and sleeves. My favorite method for finishing necklines on t-shirts can be found in the original easy tee post. I also use lots of thrifted men’s and women’s tees for fabric! Hello, I was wondering if you could use fabrics other than knit or stretch kin of matrial? I’d like longer sleeves too please. I’ll work on it! In the meantime, you should be able to just lengthen the short sleeve without too much trouble. Yep! I just made a long sleeve one – just lengthen the sleeve lines down and tape them in slightly. I’ll see if I can’t get an example posted soon. Thanks! You are a true blessing. I haven’t sewn in many years but this takes out some of my fear to start up again. Thank you very much for sharing your great talent. Thanks for making modest clothing too. thanks for posting this! I need to work on a different style of shirt for my girls. 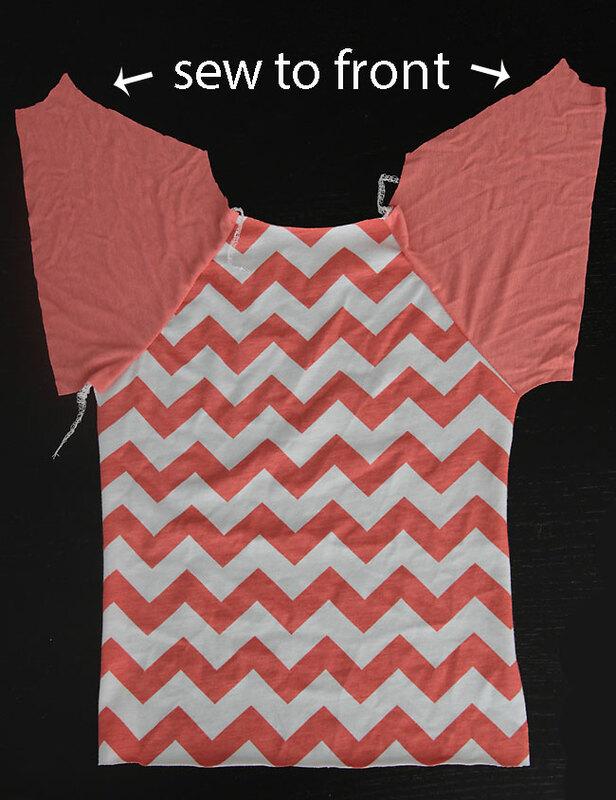 I have been making them a bunch of dolman type shirts, and while it is cute I really wanted a new pattern! thanks for the help! Oh! My! Your tutorial is terrific — thanks so much for sharing it with us! I know how long it takes to do one like this and your readers appreciate it greatly. Nice switch on the sleeves, too — it enhanced the style factor for sure! Thanks! I’m glad you like the tutorial – and yes, the sleeve switch helped! I was ready to scrap the shirt because I just didn’t like it, but the grey sleeves saved it! What a lovely tee! And what a great tutorial! Thanks! 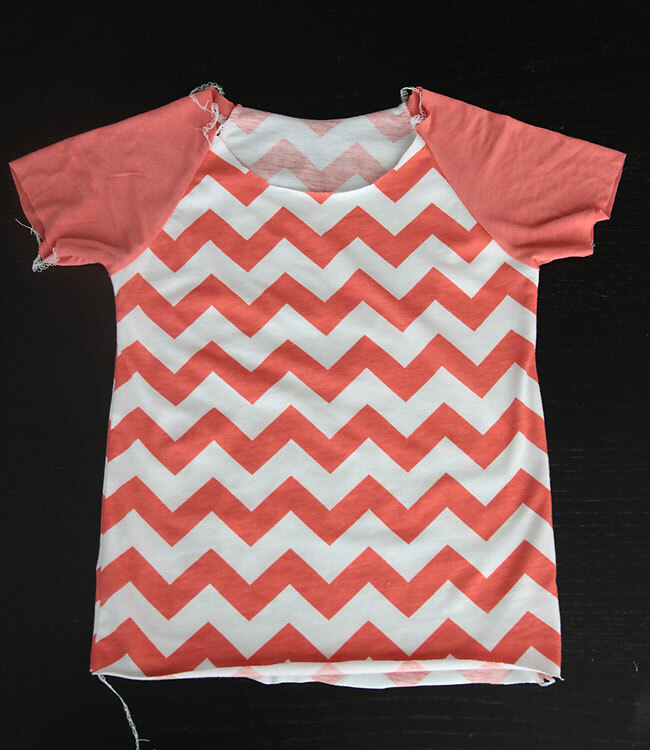 I’ve just started sewing with knits and I can’t wait to sew a bunch of raglan tees for my daughters. I know they will love it! fabulous! Thanks for taking the time! I love this so much! Thanks for making a great tutorial! This is such a fab and easy project, even a novice like me want to try this. I don’t have a serger though :(. What setting do you recommend to use on normal sewing machine? 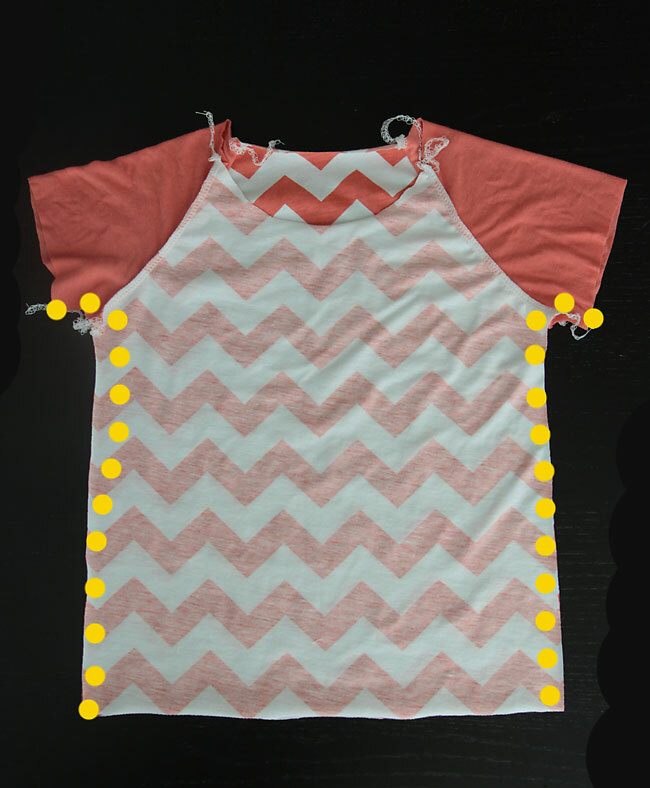 Any part of the shirt that’s going to stretch (such as the neckline) needs to be sewn with a stitch that will allow for a little stretch, so a narrow zigzag is a good way to go. Depending on your machine, you might even have a “stretch stitch” you can use. For side seams and other seams that won’t get stretched while wearing, and plain old straight stitch will work! 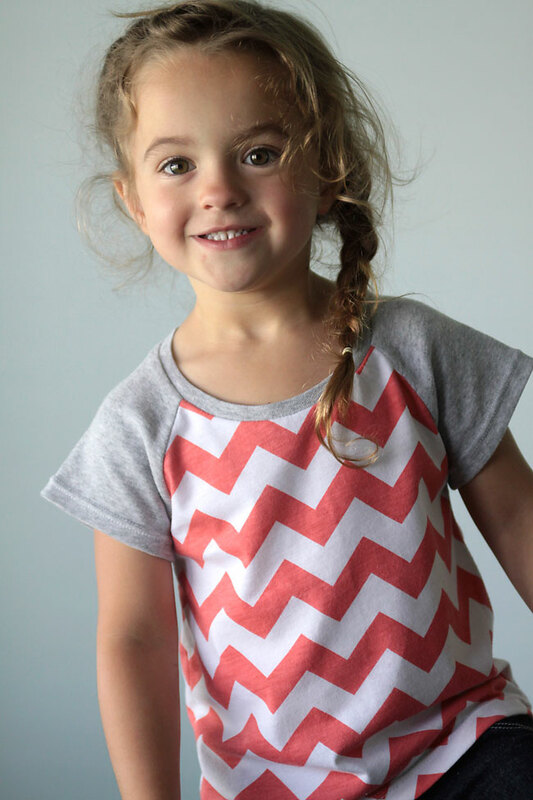 I just did a raglan tee for my daughter. It’s not bad, the only problem is that the neckline is too wide and ends up “pointing” upwards instead of lying on the shoulder. What did I do wrong? And how can I fix it? Thanks! 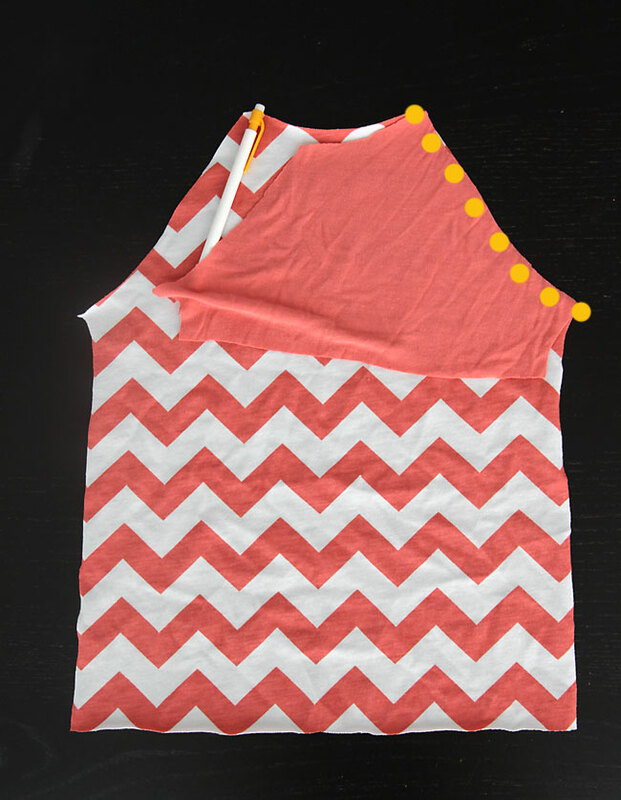 This is so cute i’m going to try to make this for my niece! I love this! It was so easy to make. The only problem was the neckline came out floppy and stretched (I don’t know why since I didn’t have to work with it enough to stretch it out) and the sleeves were too tight. I’d love to use this pattern again. Any advice on how to fix it for next time?? Thank you!! Lovely, clear, complete tute. Love the tutorial! 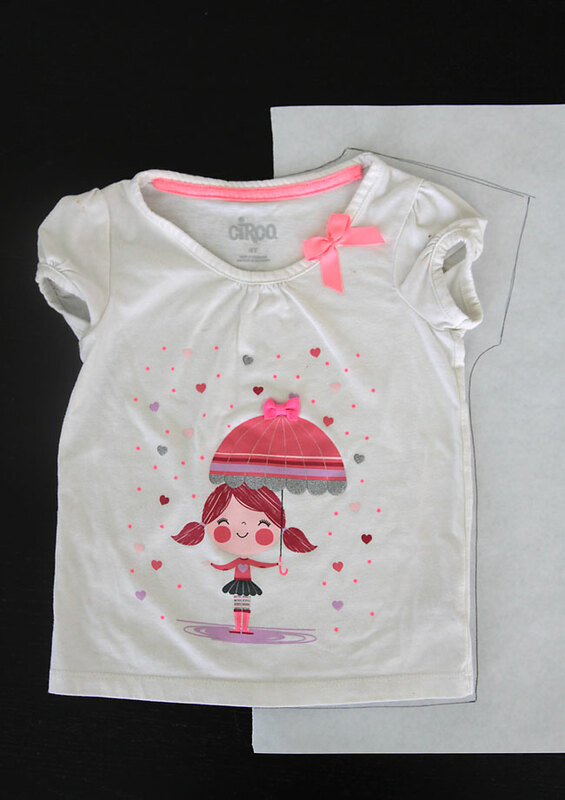 Great, easy to make shirt! This is a PHENOMINAL tutorial!!!! Thank you so much for sharing!!! Could this be done the same way for adult size. Thank you for these clear directions..I have been looking for something on the simple and easy side….I’m going to try it tomorrow for myself…and if it works out then I’ll definitely will be making more! Very simple and direct instructions! What a helpful tutorial as a basic technique to adapt to other design ideas! Mine is a terry beach cover for my 6 y.o. granddaughter from a bath towel, hand towel (for hood) & wash cloth (for pockets) with other “girlie” embellishments (TBA). I was stuck until I came across this tutorial…I so appreciate the the time you took to post simple instructions & great pics for those of us who would rather spend the $12 (?) saved (from purchasing a pattern) on her ice pops & sunscreen! LOL ? Brilliantly simple! Thank you for this! Thank you very much, this is gorgeous! And you are very kind for sharing it with all of us for free! Thanks for this great tutorial! I was able to use your method to draft raglan sleeved nightgowns for myself and my daughter. Hello! Just a tip for those that don’t like hemming the sleeves or bottom of the shirt. I couldn’t find the color knits I needed at any of the fabric stores, and didn’t have time to wait for them to be shipped in. So I bought a 2XL mens t shirt for $3 and a 5x womens camisole that was on clearance for $2 at walmart. If you line the bottom of your pattern up with the bottom of the shirt, then you can use the existing hem from the purchased shirt, and you don’t have to hem it yourself. Same with the Sleeves! Just line the end of the sleeves up with the existing hem! I was able to get two 4T shirts out of those shirts! I even used the collar from the mens shirt as the collar on one of my shirts. Saves time and looks like a store bought shirt!